COSTA MESA, Calif.-Eastern European heavyweights slugged it out in Orange County with Kubrat Pulev scoring a knockout win over Bogdan Dinu on Saturday evening. 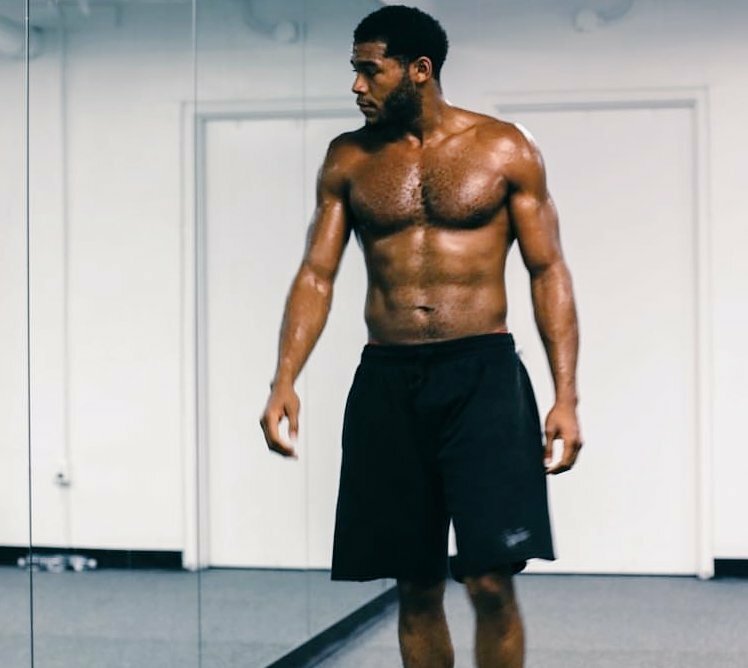 The win keeps him in line for a possible showdown with Top Rank’s newly signed Tyson Fury. 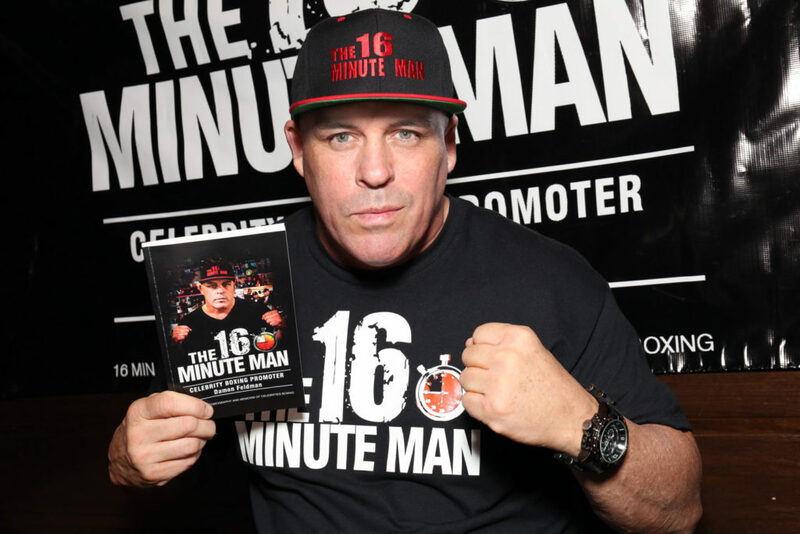 After a slow start the Bulgarian heavyweight Pulev (27-1, 14 KOs) scored the knockout win over Romania’s Dinu (18-2, 14 KOs) before a large supportive audience who arrived with Bulgarian flags and hats at the OC Hangar in Costa Mesa. 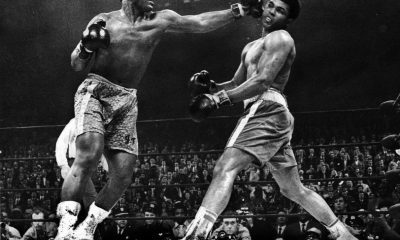 Until the fifth round the action lacked with both heavyweights not eager to fire. 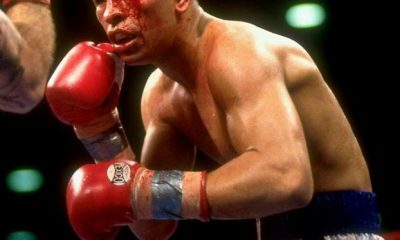 But an angry exchange of blows by Dinu saw Pulev emerge with a cut over his left eye. It also opened up the action between the European heavyweights. 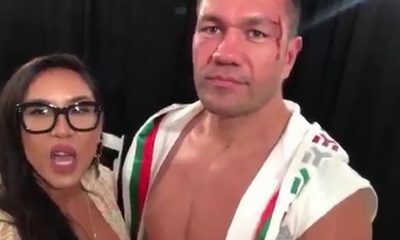 Pulev increased the pressure and caught Dinu in the neutral corner where he unloaded right after right on the ducking Romanian fighter who dropped to a knee and was hit behind the head with a blow. The knockdown was ruled down by an illegal punch and a point was deducted from Pulev. It didn’t matter. The Bulgarian heavyweight proceeded to unleash some more heavy rights and down went Dinu again. 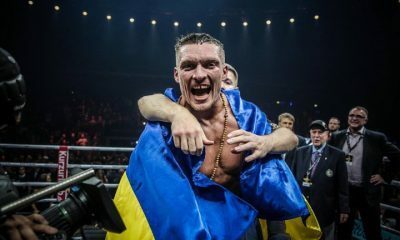 The Romanian fighter beat the count and was met with more right hand bombs and down he went for good this time at 2:40 of the eighth round. 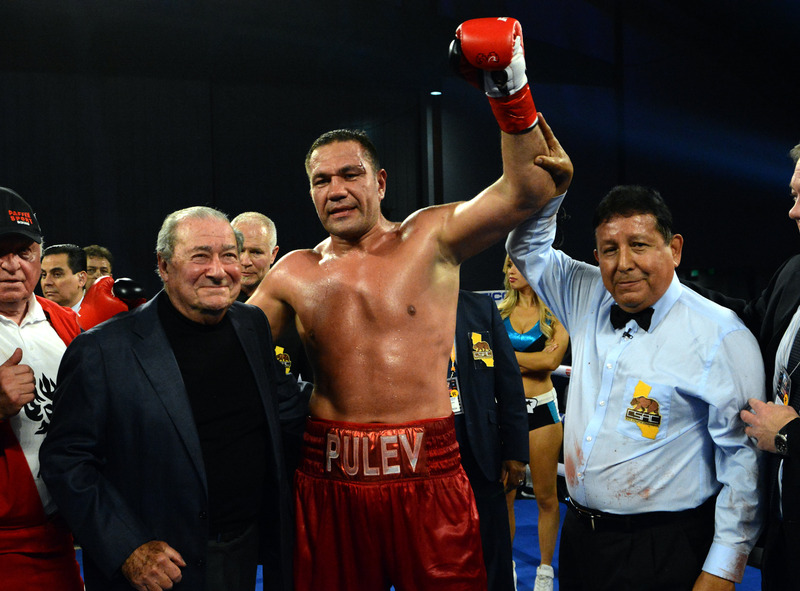 Referee Raul Caiz ruled it a knockout win for Pulev. Dinu felt that illegal blows led to his downfall. But the winner Pulev was satisfied. “It doesn’t matter, I was prepared and really good in this moment. I think I was very good boxing today and showed good punching today,” Pulev said. An expected battle between flashy ex-super bantamweight world champions didn’t deliver the goods as Jessie Magdaleno (26-1, 18 KOs) defeated Rico Ramos (30-6, 14 KOs) by unanimous decision after 10 rounds in a featherweight contest for a vacant WBC regional title. A tentative Magdaleno was cautious and deliberate against Ramos who seemed to be stuck in slow motion for the first half of the fight. Behind some lefts to the body and snappy combinations Magdaleno mounted up points for six rounds. Ramos stepped up the action in the seventh round and began stepping into the danger zone while delivering some threatening combos inside. Magdaleno resorted to holding and moving as the action shifted in Ramos’s direction. But it was never enough as Ramos seemed to lack pep. 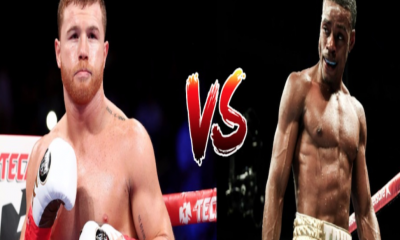 The last two rounds saw Ramos engage with Magdaleno but neither landed the killing blows. After 10 rounds all three judges saw the fight in favor of Magdaleno 97-93, 98-92, 99-91 who now holds the WBC USNBC featherweight title. Max Dadashev (13-0, 11 KOs) was dropped in the second round by muscular Filipino southpaw Ricky Sismundo (35-13-3, 17 KOs) and had a look of surprise. He turned it up in the third round and caught Sismundo rushing in with a slick counter left-right combination on the button. 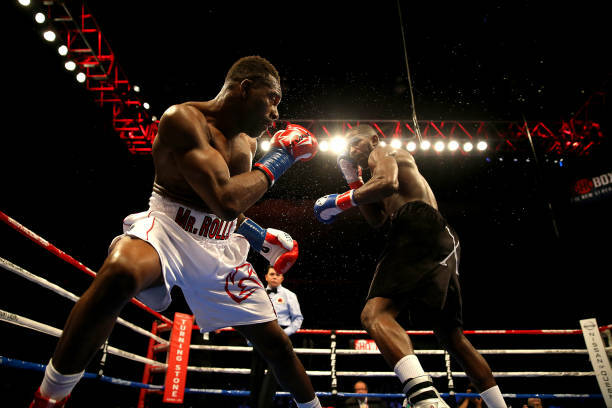 Sismundo was counted out by referee Tom Taylor at 2:30 of the third round of the super lightweight clash. Former Olympian Javier Molina (19-2, 8 KOs) had a rough customer in Mexico’s Abdiel Ramirez (24-4-1, 22 KOs) who never allowed him space to maneuver in their super lightweight match. After eight close turbulent rounds Molina was given the decision by scores 78-74 twice and 79-73. 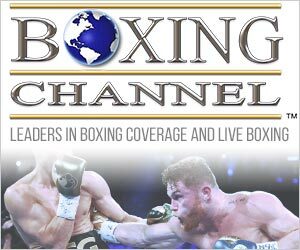 South Africa’s Chris Van Heerden (27-2-1, 12 KOs) thoroughly out-boxed Mexico’s Mahonry Montes (35-9-1, 24 KOs) until a clash of heads erupted a cut over his right eye. The fight was stopped in the sixth round and Van Heerden was given a technical decision by scores 60-54 on all three cards. Welterweights Bobirzhan Mominov (10-0, 8 KOs) and Jonathan Steele (9-3-1, 6 KOs) slugged it out for six back and forth rounds at high intensity. There were no knockdowns but plenty of high level stuff going on. The bigger Mominov had the advantage and tried to take out Mitchell, but the smaller welter from Texas was just too tough and skilled to be overrun. Judges scored it 59-54 three times. Good stuff. 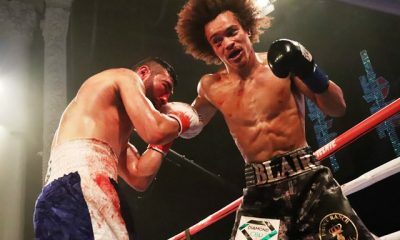 Detroit’s Erick De Leon (19-0-1, 11 KOs) survived a knockdown in the fifth and rallied to win by technical knockout over Mexico’s Jose Luis Gallegos (16-6, 12 KOs) in the seventh round of a lightweight clash. A barrage of unanswered blows by De Leon forced referee Ray Corona to halt the fight at 1:55 of the seventh round. 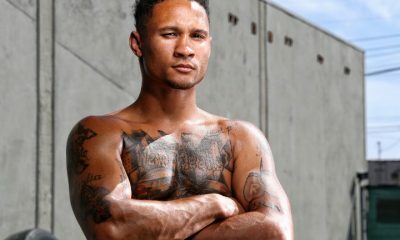 L.A.’s David Kaminsky (4-0, 2 KOs) out-pointed rugged Arizona’s Estevan Payan (1-7-1) to win by unanimous decision after four round in a middleweight contest. Tyler McCreary (15-0-1, 7 KOs) fought to a draw with Mexico’s Roberto Castaneda (23-11-2) after six rounds. 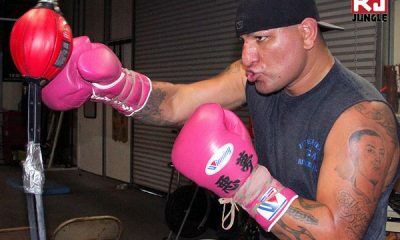 He got all he could handle from the Mexicali featherweight as both traded blow for blow throughout the contest. It was good experience for the young McCreary who looked good but tried too hard to take out the hard headed Castaneda. Eric Puente (2-0) beat Alejandro Lopez (1-4) by decision after four rounds in a lightweight match by 39-37 scores all three cards. It was a very close match with little separation between the two.